Bolt-In Center g-Connector Support for 64-70 Mustang and 67-70 Cougar (Hardtop) - Tubular center support brace spans the undercarriage, connecting the driver- and passenger-side frame connectors. Subframe g-Connectors (TCP SUBFC-01) required for installation. 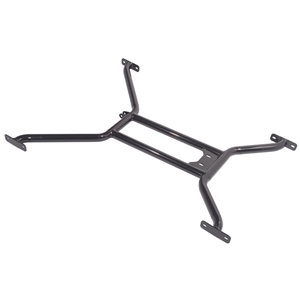 Features mounting plate for optional driveshaft safety loop and bracket for standard-length torque arm (33" Mutang, 36" Cougar).Fits completely under floor. Note: May require custom exhaust installation. Room available to tightly run 3" dual exhaust.